Vietnam. Few places conjure up so many images. From spectacular white sand beaches to lush verdant jungles to small villages alongside paddies of a thousand years to teeming modern cities. From ancient Buddhist temples to 19th century French colonial architecture to 21st century high rises. From battlefields of a hundred years – against the Japanese, the French and the Americans, and of their own civil war. 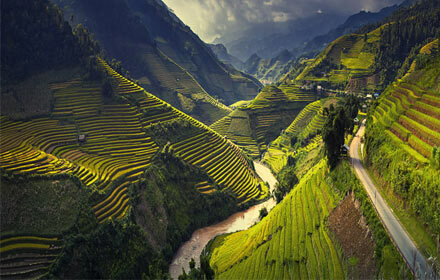 Vietnam is a complex mosaic of history, culture and scenic beauty. Of energy and mass and perfect tranquility. We are now in the 50th anniversary of much of the American involvement in the decades-long Vietnam War. Our first battles were in 1965 and the last in 1972. Our brothers and cousins, fathers and grandfathers, and others fought in this mystical land half a century ago. Some of you did, as well. In the titanic, 45 year struggle of the Cold War, the battles in Vietnam played a significant role in the worldwide order. Conflict is a long and continuous waging of effort – militarily, yes, but also diplomatically and economically and culturally. Today, the US and Vietnam are strong partners in many aspects. Our Vietnam tour itinerary will include visits to many Vietnam War sites but will also have so many other significant locations of historical, cultural and natural beauty importance. Come with us to explore this vibrant, beautiful land. 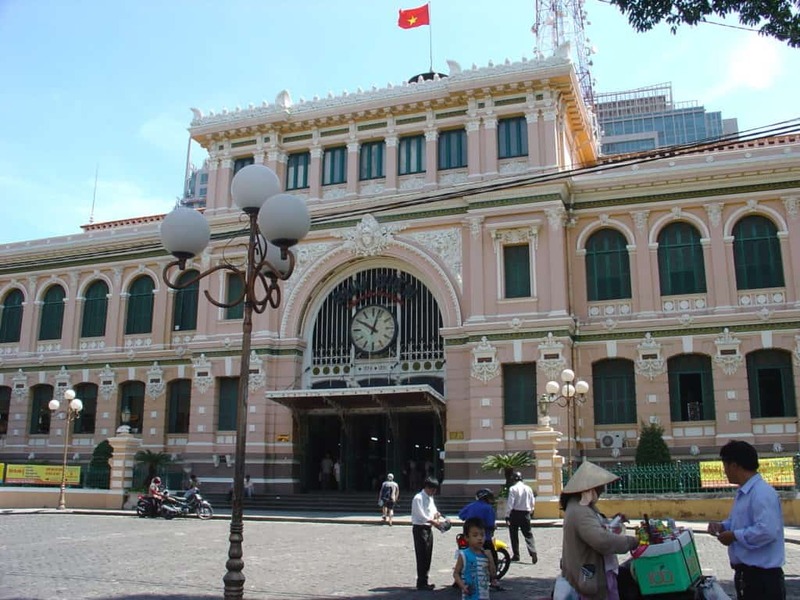 We will travel from the southern capital of Saigon (Ho Chi Minh City) through the central highlands and coast through Danang and Hoi An and on to Hue. Along the way, we will visit battlefields and temples, white sand beaches and quaint villages, mountain valley resorts and coffee plantations, incredible shopping opportunities in ancient markets and splendid visions of unique flora and fauna. We will “experience” Vietnam like no others. Finally, we will conclude our Vietnam tour in the environs of Hanoi, the national capital and its nearby World Heritage site of Ha Long Bay. This is truly the adventure of a lifetime! 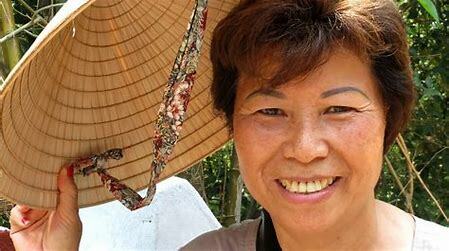 Essential History Expeditions has partnered with Nhu Lanh, owner of Discerning Traveler Vietnam. While EHE’s Dr. Brian DeToy will lead the historical perspective of Vietnam, Nhu will join us for the entire expedition, sharing her love of her country and its culture, history and traditions. 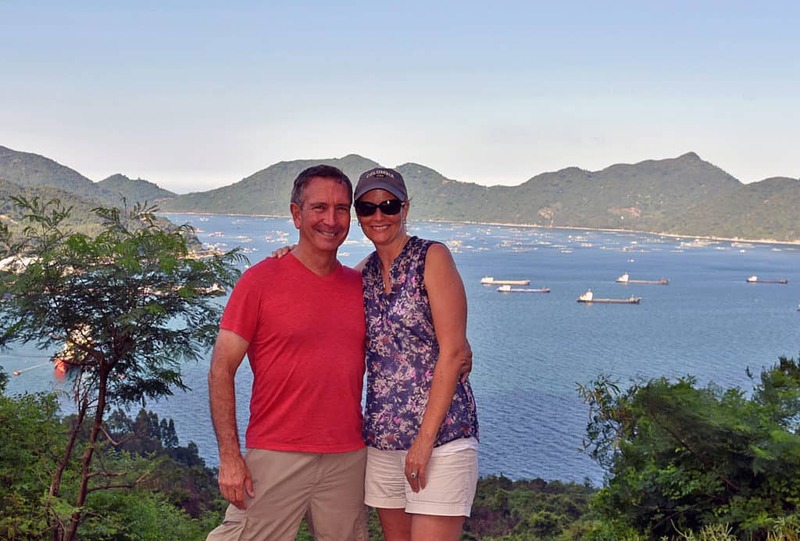 Many Americans travel to Vietnam on their own to experience the history, natural beauty, small villages and big cities. 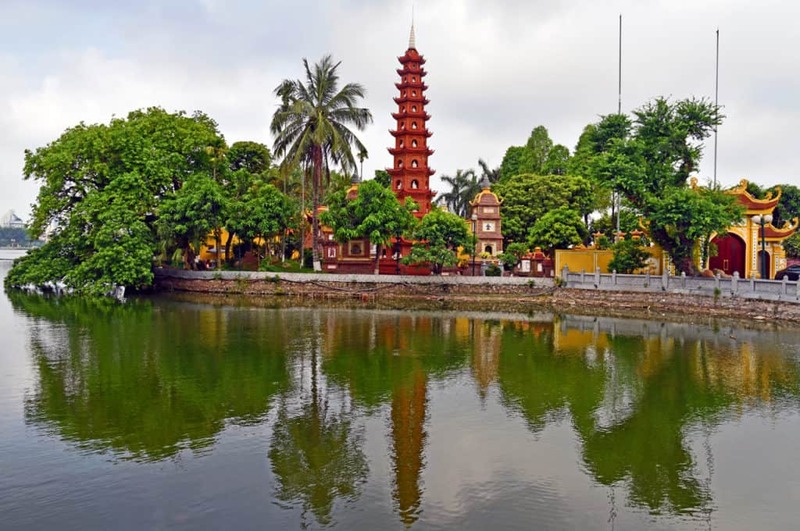 However, Essential History Expeditions is for the traveler who wants to come away from a wonderful vacation with a deep understanding of the complicated history that shaped Vietnam into the country it is today. This tour incorporates both the culture of today’s Vietnam with the US involvement in the Vietnam War 50 years ago. Both Brian and Sheryl’s fathers served in Vietnam, so this tour is personal to them both. If you or your father or brother or uncle served in Vietnam, join us to see the country today and to understand the war era by walking in the footsteps of those who walked before you. If you have a family member who served, let Brian know the unit, and we will make every effort to visit those specific locations and weave in the stories of that unit. 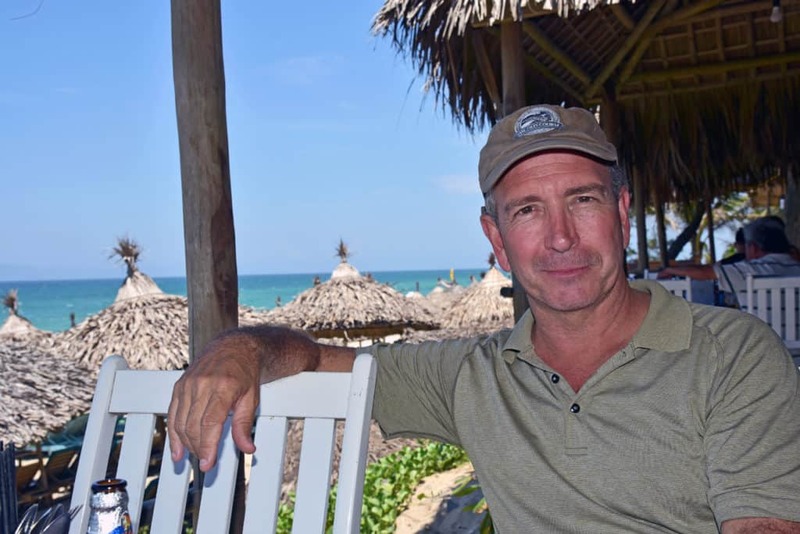 What sets Essential History Expeditions and Dr. Brian DeToy apart is his unique experience with 14 years as a university professor including teaching history and strategic studies at West Point, 28 years as a US Army officer with combat experience, and 23 years of leading tours. We encourage you to read our blog, “Vietnam: Ghosts of Our Fathers” that describes our recent journey through Vietnam. For this Vietnam expedition, we have partnered with a delightful and knowledgeable Vietnamese guide who will be with us every step of the tour. Nhu will not only show us local restaurants and places off the typical tourist path, but she will share her perspectives on her country’s complicated past. You will fall in love with Nhu, just as we did! Saigon, now Ho Chi Minh City, although many still call it by its old name. Largest and most spectacular of Vietnam’s cities, with centuries of history and cultures mixing side-by-side. Arrive at the Renaissance Riverside Hotel Saigon (a Marriott property). The Renaissance overlooks the Saigon River, two blocks from Dong Khoi Street, the famed Rue Catinat of French colonial days! Lunch on your own if you’ve arrived early. 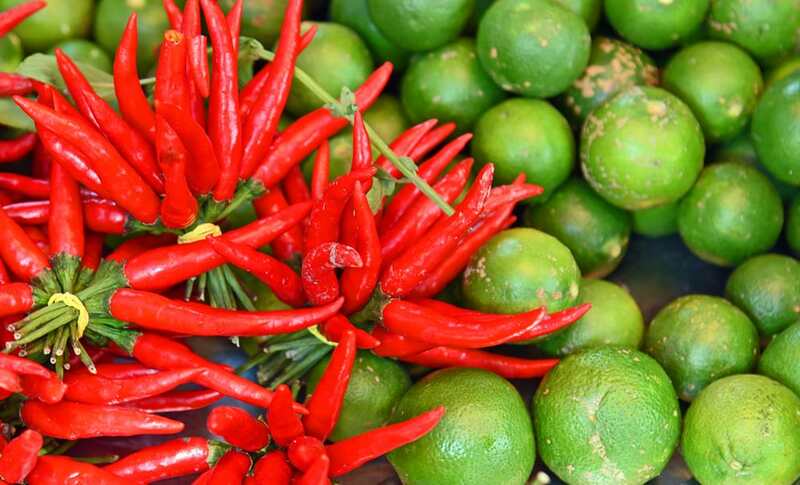 Try out your first authentic Vietnamese dishes! We will be at the hotel all day with maps and recommendations for those that want to explore the vicinity of the hotel. Group gathering in hotel lobby for introductions. Group dinner at a wonderful Saigon restaurant and overview of the trip. Depart hotel for day-long tour of the Mekong Delta south of Saigon. This is a densely populated area and one of the rice-baskets of the country. It is a labyrinth of canals, streams and rivers with floating villages and markets, green rice paddies and an ancient way of life. In Cai Be, we will enjoy a walking tour of this quaint rive town and the local market before boarding a small riverboat to visit the floating markets on the Mekong River. Back on dry land, we will explore an island, visiting some fruit farms and candy makers. We will then travel by smaller timber rowboats through some of the narrow canals on the island before again stopping tour the island. We will enjoy a group lunch at the Thai An restaurant of traditional Vietnamese food before returning to our boat for our return to Cai Be town and our departure to Ap Bac. We will visit the village and surrounding fields of Ap Bac, site of one of the most important early battles in the war. This critical 1963 fight changed the nature of US involvement. On your own dinner in Saigon. After a refreshing restful night and breakfast, Brian and Nhu will lead a walking tour of central Saigon. We will get you oriented to the layout of the city and the important sites — historical, cultural, markets, etc. Included will be the war-era hotels, the Opera, the Central Post Office, Notre Dame Cathedral, Reunification (Presidential) Palace, War Remnants Museum, Jade Pagoda, City Hall, pedestrian Nguyen Hue Street, Ben Thanh Market and the Bitexco Financial Tower. Lunch on your own — we will have pointed out some places along the way and will provide recommendations. Enjoy on your own time to visit the many incredible Saigon sites for a more in-depth experience of the sites, such as museums and markets, that interest you most. Depart for Tan Son Nhut Airport for a domestic flight to Pleiku. This airport was one of the most important US airbases throughout the conflict. Visit Plei Me Special Forces Camp, the siege of which in October 1965 resulted in the opening of the wider US war. Visit the Landing Zone (LZ) X-Ray at the base of the Chu Prong Massif, a small mountain on the Cambodian border. Here, in November 1965, along the Ia Drang river valley, the US and North Vietnamese armies had their first battle of the war. It was made famous in the movie “We Were Soldiers.” For many in the US Army, to this day, this is sacred ground. Depending on road conditions at the time of the tour, the visit to LZ X-Ray may include individual motorcycle taxis for a short distance. Check in to Pleiku hotel. Group dinner in Pleiku — check for differences in dining in the Central Highlands compared to Saigon and the Mekong. Depart for day-long visit to Vietnam War battlefields at Kontum and Dak To. North of Pleiku and still in the Central Highlands, these two towns were scenes of rugged pre-Tet fighting in 1967 and again in the NVA attacks in 1972 and 1975. 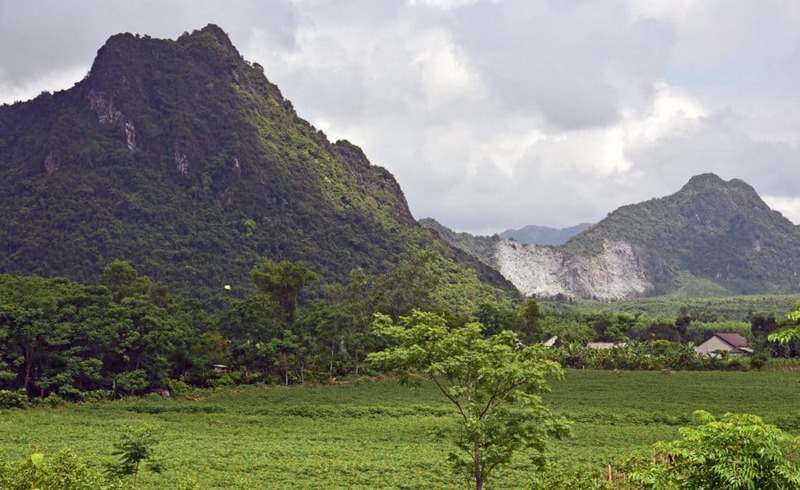 Continue driving through the beautiful and rugged Central Highlands to Hoi An. 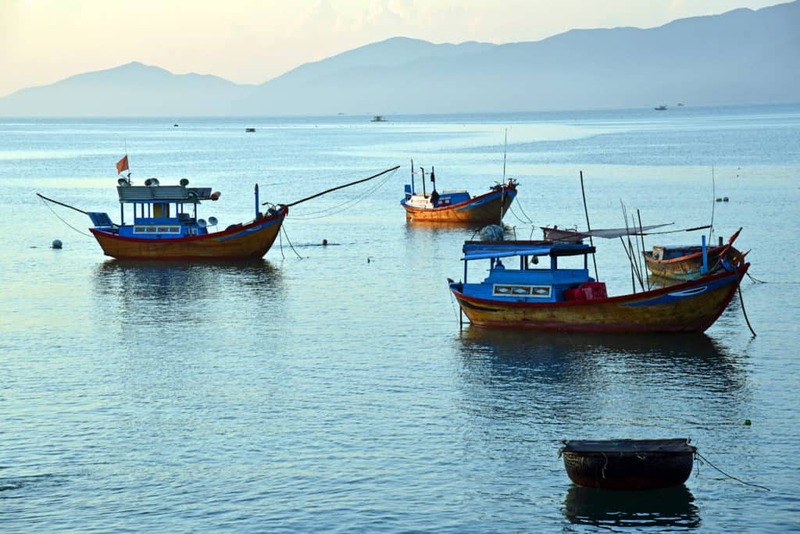 Arrive at Hoi An, an ancient and perfectly preserved town on the coast. 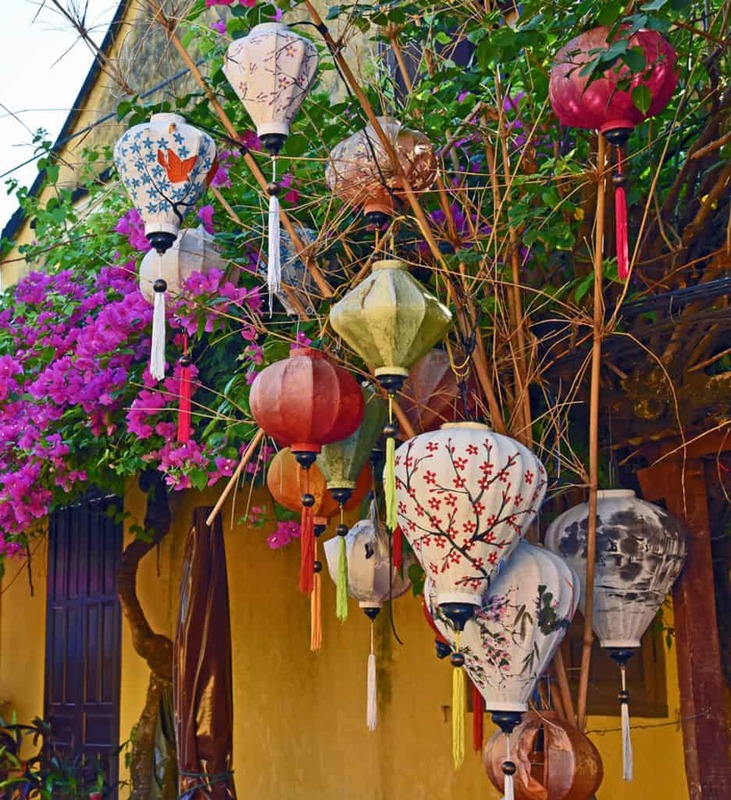 When you think “Vietnam” you are thinking of Hoi An with its markets, pedestrian-only lanes, shops, women in traditional ao dai, and a beautiful beach. Check in to Hotel Royal Hoi An, a Sofitel collection hotel. Located on the banks of the Thu Bon River in the UNESCO World Heritage town of Hoi An, Hotel Royal Hoi An is a perfect blend of historical charm and modernity. Its refined style inspired by Art Nouveau has a delicate touch of Japanese and Vietnamese cultures and offers spectacular views of the river and ancient town. Group dinner on riverside rooftop restaurant Sakura for sunset views and lighting of river lanterns. We may have a special guest join us for dinner on this evening! 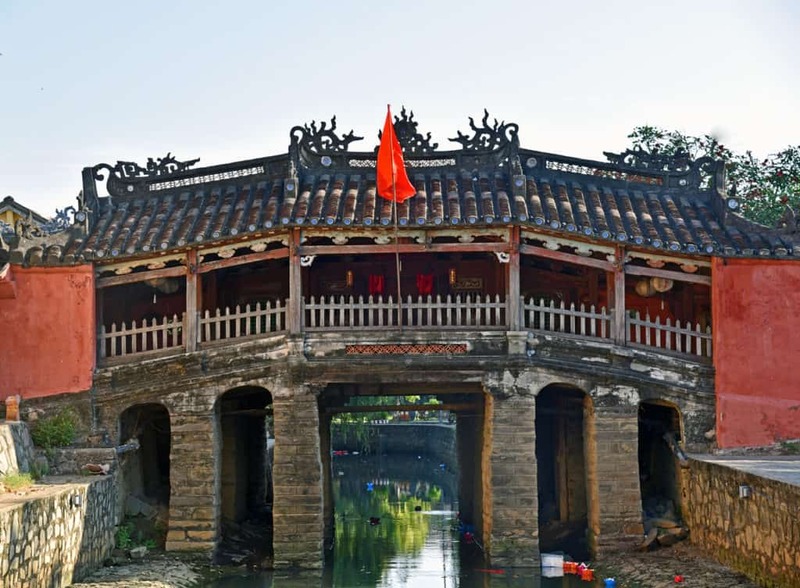 Walking tour of Hoi An — markets, shops, pagodas, Japanese Bridge, ancient houses. After several packed expedition days, it’s time to relax! 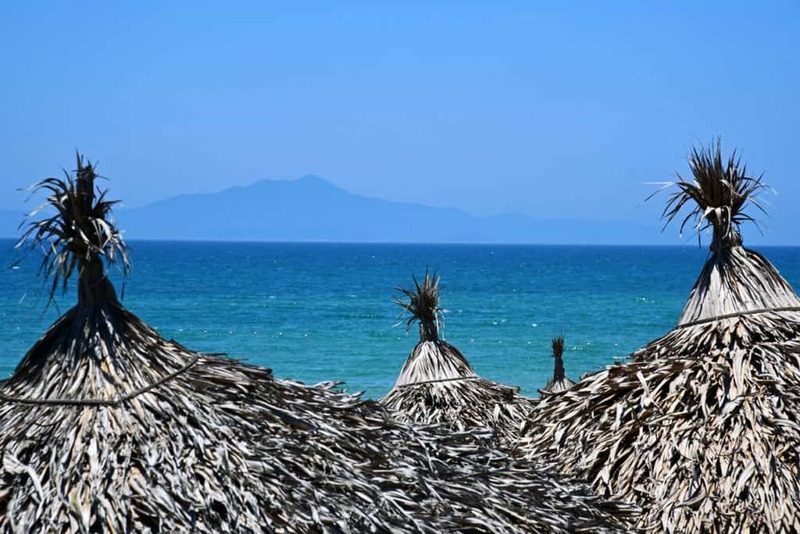 The rest of this day is yours — on the beach at An Bang or poolside at our gorgeous hotel or shopping in Hoi An. This is the place to get your Vietnamese clothing tailor-made. This will be a truly special day! In the morning, we’ll stop at Marble Mountain for shopping in one of the country’s top carved-marble emporiums. Great prices and shipping straight to your American city! We have the amazing opportunity to experience authentic village life in Xa Hoa Qui (formerly known as Ky La) with renowned author Le Ly Hayslip and her 90-year-old sister as our hosts. With Le Ly and her sister as our spiritual guides, we will experience the magic of their ancestral home. We will also enjoy a village meal with the family. Afterward, Le Ly will accompany us to the local children’s hospital that she supports. “When Heaven and Earth Changed Places” tells the story of Le Ly’s life as a young peasant girl at the outbreak of the Vietnam War and on through the entire conflict. 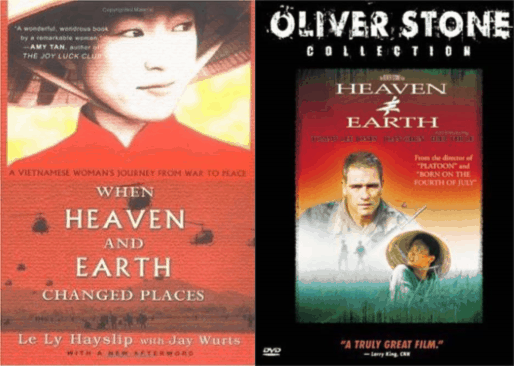 Oliver Stone subsequently brought the book to life as “Heaven and Earth,” the third film in his trilogy of the Vietnam War, following “Platoon” and “Born on the 4th of July.” Born and raised during a time of great conflict in her country, Le Ly has lived in the US since she married an American in the 1970s. Le Ly has made it her life’s mission to build bridges between the two countries and to support her ancestral village. We are incredibly blessed to have her as our guide for this special day! Next we will stop in Danang on China Beach — this city, port and airbase comprised one of the most important American base complexes of the entire war. China Beach was an R&R spot for soldiers to escape for a long weekend. Continue on to Hue where we will check in to our hotel. Group dinner in downtown Hue. We will depart the hotel by auto rickshaws so that we can truly take in the pulse of the city on our way to The Citadel. Walking tour of The Citadel, the early 19th century city-within-a-city that was home to Vietnam’s last dynasty. 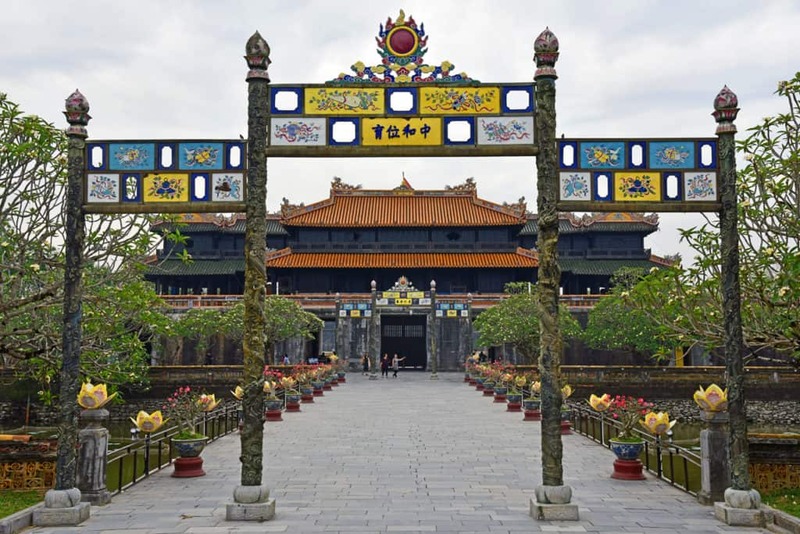 It is a wondrous royal site with three layers of defense and living arrangements for the royal family and the mandarins that governed Vietnam. We will also discuss the incredibly difficult 1968 battle of Hue that occurred during the famed Tet Offensive. Here was the greatest urban fighting of the entire war. Time on your own to explore Hue. You may opt for an add-on tour of the Perfume River. Dinner on your own at one of the many wonderful restaurants in Hue. We will depart for the Demilitarized Zone (DMZ) area. All-day touring of the famed military sites from the Vietnam War — the Marine hilltop base at Khe Sanh where a two-month siege occurred in 1968, the Rock Pile observation post that kept eyes on the critical route 9, the bridge at Dong Ha where an American captain saved South Vietnam with his incredible heroics in 1972, the DMZ and North Vietnamese tunnel complex at Vinh Moc, followed by our return to Hue. Group lunch in Dong Ha. On your own dinner in Hue. We will depart for the Hue airport (the old US airbase Phu Bai). Flight to Hanoi and drive to the Hilton Hanoi Opera hotel, on the border between the Old and French Quarters and across from the Opera, where we will check in. Group lunch near the Hilton hotel and walking tour of the French and Old Quarters, the heart of the Vietnamese capital. The Old Quarter has been inhabited for over 1,000 years and includes a maze of ancient shopping streets, today teeming with wares, restaurants and lively bars. Connecting the two quarters is the Hoan Kiem Lake, sacred to the Vietnam foundation story. The French arrived in the 18th century as missionaries and trades and in the 1860s as colonial overlords. They rebuilt a portion of the city and today its wide, tree-lined boulevards evoke those days. Several museums are in this area and we will visit the Hoa Lo Prison, known to Americans as the Hanoi Hilton that housed US pilots captured in the war, including Senator John McCain. St. Joseph’s Cathedral is also well worth a visit. 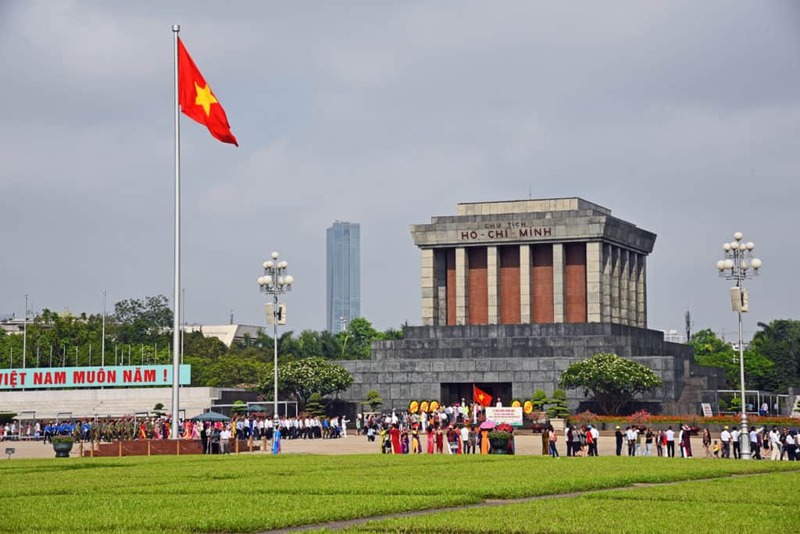 We will take a bus or cyclo to visit the West Lake area, where we will see the site where Lt Cmdr John McCain was captured in 1967, the Ba Dinh Square area that was the former location of the French colonial government and is now the Vietnamese government center. Numerous museums to Ho Chi Minh, including his mausoleum, are here. Nearby is the ancient Temple of Literature, site of Vietnam’s first university, and the museum of Fine Art. Enjoy the afternoon on your own to explore the treasures of Hanoi. Optional activities could include a bike tour, cooking class, etc. Group dinner followed by Opera or Jazz. The beautiful Opera house, a twin to that in Paris, hosts a variety of music today and the Binh Minh Jazz Club is the best in the country. Join us at 6am for optional group exercise in a park nearby to the hotel! The Vietnamese people are early risers and many flock to their neighborhood parks to partake in individual and group exercise. It is an amazing sight and we will join right in! Lunch will be either at the Hong Ngoc rest stop enroute or at a lovely hotel at the mouth of Halong Bay. Arrive at Halong Bay and embark on our overnight cruise boat. 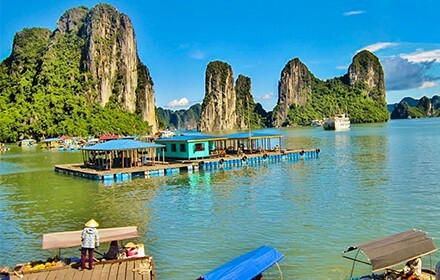 Halong Bay is a UNESCO World Heritage site with nearly 3,000 limestone karst islands rising from the beautiful waters. It is a wonder of serene natural beauty, with caves, beaches, floating villages and infinite natural beauty. Enjoy a sunset dinner aboard the boat. 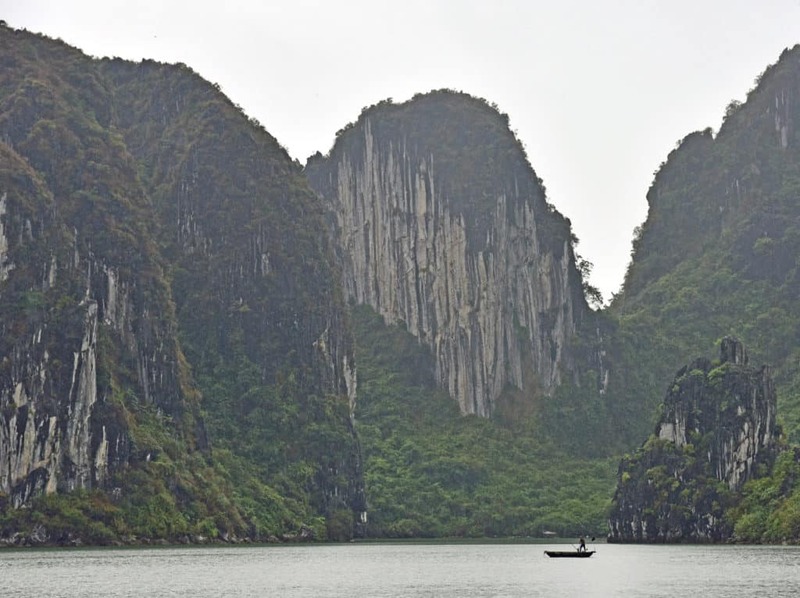 Enjoy a gorgeous morning cruise through the incredible limestone karst islands. After breakfast aboard the ship, visit an incredible cave or kayak through the emerald waters. The incredible beauty of this magnificent area cannot be overstated! Following lunch, we will return to the port. Debark and return to Hanoi. Arrive Hanoi and check-in to hotel. Say good-bye to new friends at a final group farewell dinner. Suggested morning departures from Hanoi so as to arrive in US able to make connections home on Sunday evening. Transfers from hotel to airport included. Optional Extension: Two nights in Sapa, with departure from Hanoi on the afternoon or evening of May 1, 2018. Sapa is a mountain town north of Hanoi approaching the border with China. The mountain scenery, including the famed terraced paddies, is the most dramatic in the country. The cost for this two-day extension is $500. 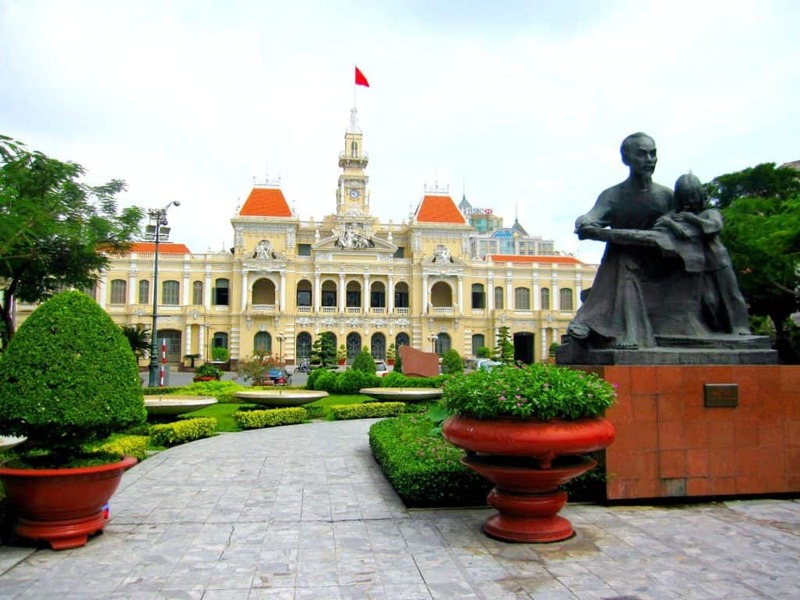 In-depth guided tours with professional historian and local Vietnamese guide. Visit to major Vietnam War battle sites. 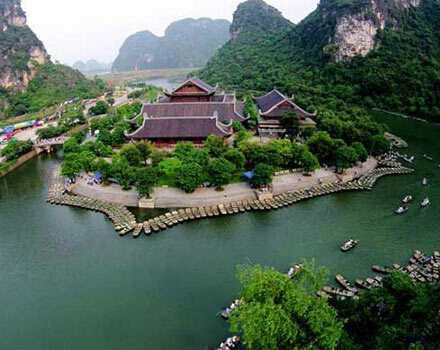 Visit local Vietnam cultural/historical sites. Transportation by van or bus throughout trip. Optional opportunity to role-play an important character in Vietnam War or Vietnam cultural history. Majority of all meals, as indicated in the itinerary. Two bottles of water per day per person. All entrance fees for group activities. Optional travel insurance available through Berkshire Hathaway Travel Protection. Please contact Sheryl at sheryl@historyexp.com for a personalized quote. NOTE: Airfare is NOT included in this tour package. Please note that the tour begins in Ho Chi Minh City and ends in Hanoi. Let’s schedule a conference call! We’d love to chat with you and answer any questions you may have. Pricing: $3,595 per person, double occupancy; $500 single supplement fee. The two-day extension to Sapa is an additional $500. Active duty and career retired military, current and career retired educators receive a 10 percent discount.